Necklaces done with message charms are a popular trend among women of all ages. These cute necklaces can be found with a variety of sayings and designs and can hold special meaning to those wearing one. From simple to elaborate designs, there are message necklaces available in a range of prices making them an option for everyone to consider. Love.Hope.Faith Charm Necklace: Done with the inspirational message of love, hope and faith, this necklace has a heart symbol in addition to the word charms. It is priced at $165 and can be inscribed on the back with an additional message for an added fee. A percentage of the proceeds of this necklace is donated to the Joubert Foundation. Breathe Necklace: Created to raise money for Cystic Fibrosis Research, this necklace is done with a round pendant inscribed with the word breathe. It can be done with an adjustable leather strap for $100 or on a sterling chain for $125. Live, Love, Laugh Charm: This charm has the three words live, love and laugh stacked on top of each other in a fun style. Courage Charm: This charm is a small silver heart with the word Courage written across the center. Best Friends Forever Charm: This charm is done in the shape of a text message box and has the initials bff written across the center. It is a lovely example of a friendship pendant. Loved Charm Necklace: Priced at $49, this necklace has a handmade Loved charm done in your choice of metals. You can choose from a chain length of either 16, 18 or 20 inches long. Custom Word Necklace: For $49, you can choose words up to eight characters long for the pendant. Submit your own word and it will be created in a cursive style. Pendants can be done in sterling silver or 14K gold-filled. Dream Simulated Birthstone Pendant: Done in your choice of 10K white or yellow gold, this necklace has a simple disc pendant with the word dream engraved in a block font. It has a single birthstone of your choice as an accent to the pendant. In addition to the word dream, this necklace can be done with make a wish or peace as well. This necklace comes with a rope chain and is priced around $255. LOVE Script Pendant: Set in 10K white Gold, this necklace is priced around $340 and has the word love written in lowercase script. It comes with an 18-inch chain. 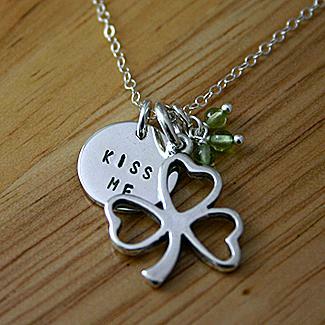 If you do not find a message charm necklace style that suits your needs, you can always opt to create your own design. 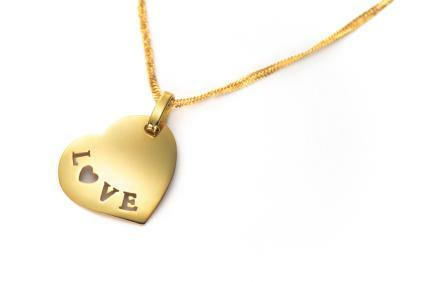 Many jewelers offer engraving allowing you to add a message to a necklace of your choice. You can also order custom charm necklaces that give you the option to create your own message that will be added to a charm.